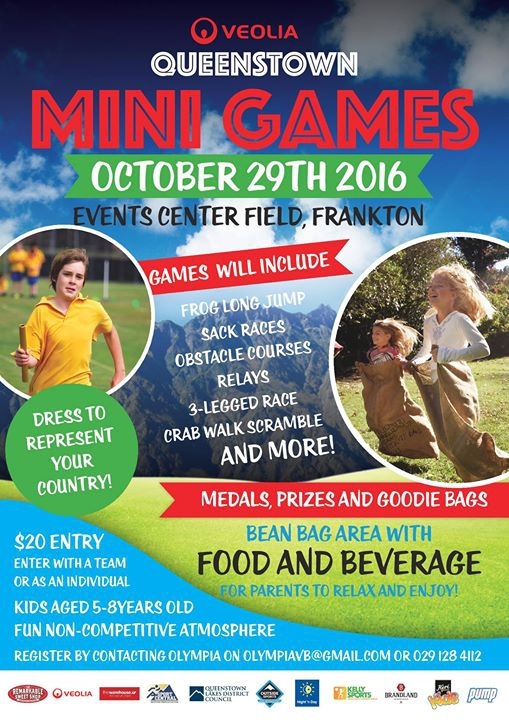 The Veolia Queenstown Mini Games is an event for kids inspired by the Summer Olympics in Rio. The spirit of the event will be fun and non competitive and the kids will enjoy playing with each other and challenging themselves. The Olympics are, above all, a time for athletes from different countries to come together and celebrate the sport they love. The theme will be similar here with an emphasis on participation, sportsmanship and enjoyment, rather than competition and rivalry. The event is for children between the ages of 5 and 8. There will be multiple stations with games such as frog long jump, obstacle courses, water balloon toss, ring hoop loop, relays etc. Each child will receive a goodie bag and a medal! There will be additional prizes too. There will be a section of the field designated for parents to relax, enjoy the day, take advantage of the food & beverage vendors and watch their kids have fun. This is the first year of what will hopefully be an annual gathering to celebrate our young ones and physical activity! Please note that spots are limited. Sign up in advance to secure yours!